What ho, brave knights and fair ladies of insurance agency-dom! 'Tis the Renaissance festival season, and fictional 16th century English Villages are popping up around the nation to welcome thousands of guests who wish to imagine life in a different era while shopping, eating and enjoying entertainment. 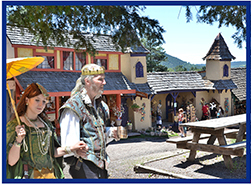 Locally, the Maryland Renaissance Festival is one of the largest in the nation and the many exhibiting artisans as well as artist and artisans around the country could benefit from RLI's Home Business Insurance Policy. Home-based business owners may think their homeowners or renters policies will cover the cost of loss or damage to business equipment, inventory or supplies. In reality, most policies exclude coverage for business exposures. Coverage includes up to $1 million in business liability protection, up to $100,000 comprehensive coverage for business personal property, $5,000 per person for medical payments to customers injured on-premises and coverage for loss of income. The product is targeted to more than 140 retail and service risks that present minimal product and/or professional liability exposures. Coverage also extends to business personal property that is in transit or temporarily off-premises, when an insured is offering products at county fairs, tradeshows, galleries, etc. Secure Your Space: Free Agency Risk Management Webinar Oct 3.
ou're an independent agent in a digital world. You have a web site. You use email. You post on social media. But can any of that get your agency sued? 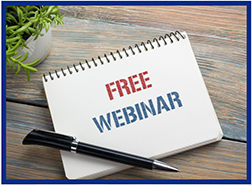 The next Big "I" Professional Liability/Swiss Re Corporate Solutions quarterly webinar, Agency Risk Management Essentials: Digital Dangers in your Marketing Presence, is scheduled for Oct. 3 at 2 p.m. ET. There is no cost to attend the one hour session. Register today to learn about the digital dangers lurking in an agency's marketing presence. Our panelists will explain how agents can use their website and social media presence to their advantage, while also revealing some errors and omissions dangers along the way. The discussion will feature Ron Berg, Agents Council for Technology executive director; James C. Keidel, Esq., managing partner at Keidel, Weldon & Cunningham; and Matthew Davis, claims manager, and Richard Lund, underwriter, both vice presidents at Swiss Re. Big "I" Professional Liability offers free quarterly risk management webinars as an exclusive Big "I" member benefit. A collection of risk management resources, including articles, checklists and webinar recordings, is available on the E&O Happens website. Log in with your Big "I" username and password to check it out. If you or your members have any questions that they would like the webinar to address, contact Jim Hanley. If your customers are relying solely on their homeowners insurance for jewelry coverage, their jewelry may only be protected against specific cause of loss and usually up to a specified limit. 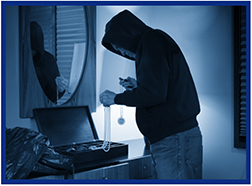 But when it comes to insuring your clients’ jewelry, they don’t want ifs and maybes. 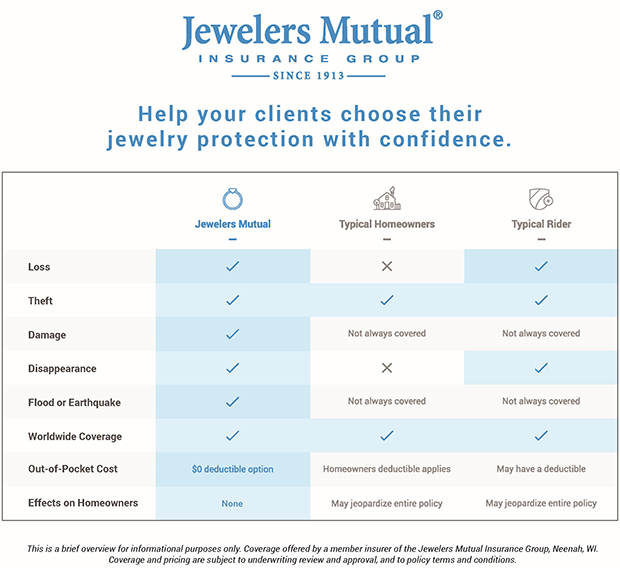 See Jeweler's Mutual's coverage comparison chart below for the benefits of having a standalone jewelry insurance policy versus relying on coverage through typical homeowners or renters insurance or a rider. 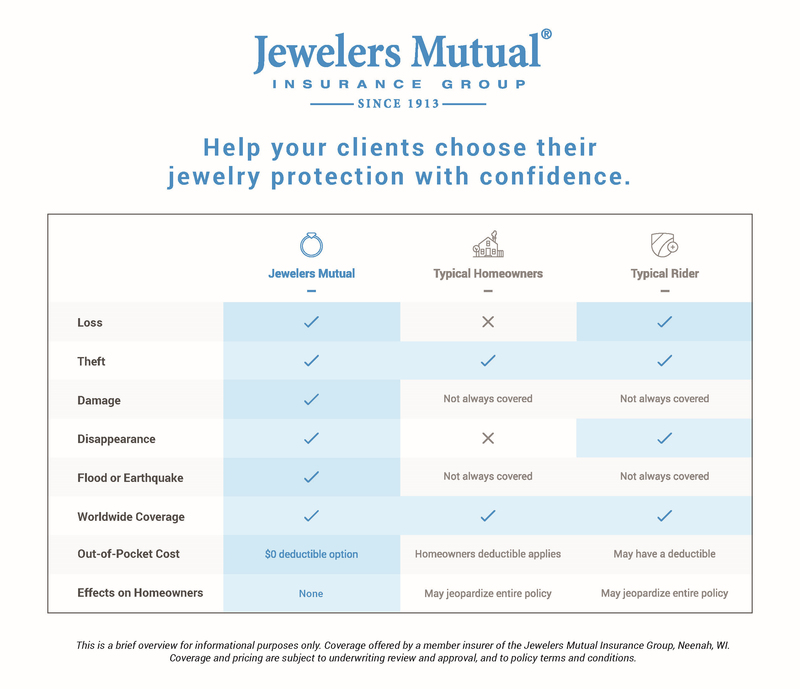 What does Jewelers Mutual cover? All types of jewelry - engagement rings, watches, earrings, even loose stones being set - are protected by comprehensive repair or replacement coverage that goes beyond typical homeowners or renters insurance. It protects against common perils associated with jewelry loss - like mysterious disappearance, and includes worldwide travel. Retain your clients. Offer a quote for worry-free jewelry coverage at jewelry.bigimarkets.com. For more information about Jewelers Mutual, select Jewelry Insurance from the Big "I" Markets product listing at www.bigimarkets.com. Coverage is available nationwide. Congratulations to this week's winners - Wendy Harvey (RI), Wendy Jefferies (MO), Jim Thomas (NJ), Diane O'Donnell (NE), & Kay Comeaux (LA). Congratulations to our agent in Florida on an Eagle Express: Auto & Home New Business sale of $4,130 in premium!